On Thursday, I had just ordered some bookmarks and felt happy. Since I was in Tokyo already, I made a trip to Shibuya to visit “JKS room” which was not originally part of my schedule. Not that I don’t want to go. Firstly, his exhibition will be open soon in Yokohama. Secondly, I really don’t have the time to queue for several hours. [Fan Account] Part 2 Finale By Aphrael77: Where is my Star? It all started on Sat 4 June around noon when we were waiting for JKS to depart JW Marriott for his rehearsal. We heard that some fans had planned to chase Sukkie and had booked vans. Another eel Apple provided us with a van driver’s contact. He charged a cheaper rate of RM 800 but he had no star-chasing experience nor any contacts, compared to RM 2,400 for another driver who had the contacts, the experience and the news. The inexperienced van driver told me that there were at least 7 exits out of KLCC and he wouldn’t know which exit JKS would use, so we thought there was no point in booking his van. We took another look and indeed saw several white vans and some fans getting into the vans parked on the other side of the porch. On the side of the porch near us was another white van, but with security personnel milling around it. Was this JKS’ van? Upon further thinking and discussion, we concluded that it wasn’t JKS’ van but it was his security personnel’s van, so wherever JKS would go later, this van was bound to follow! Also, we saw JKS’ manager getting into this van too! Read more[Fan Account] Part 2 Finale By Aphrael77: Where is my Star? 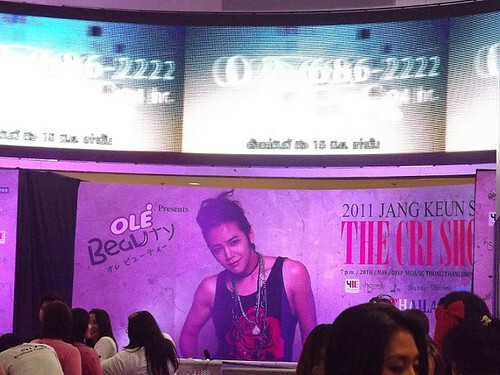 Kuala Lumpur, 5 June – Korean popular star Jang Keun Suk is holding his “The Cri Show” Asia Tour and has been to Singapore, Hong Kong and Thailand, this time finally coming to Malaysia to meet fans. 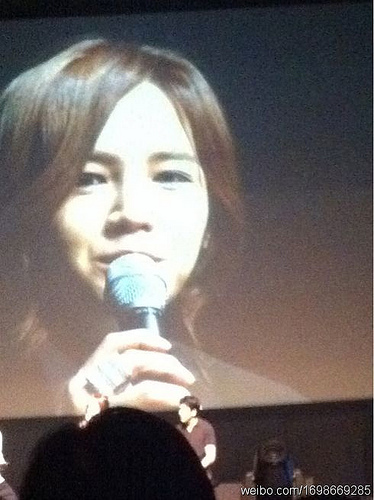 Besides the performance, JKS also had a private function and closer interaction with fans. 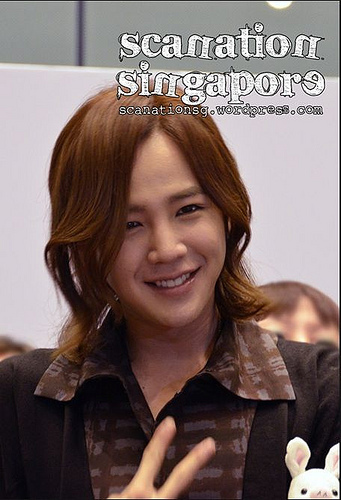 His friendliness charmed all the girls, who screamed and cheered often at the function and also at the Cri Show. The highest-priced ticket costs RM 658 (VVIP) which may appear expensive, but benefits include attending the Cri Show, private function and the autograph or photo-taking, as well as seeing the most genuine side of their idol – it was definitely worth it for eels! JKS also shared his views and thoughts with fans, and his humorous and friendly attitude made it hard for fans not to fall for his charm. Hi all, apologies for disappearing online for 2 days since Friday 3 June; everything has been so hectic and rushed. By now, I would assume other sources would have updated news of JKS and his events in Kuala Lumpur, so here is just a very quick runover. After a rather comfy coach ride overnight, we arrived in Kuala Lumpur on Saturday 4 June at 5 am, and checked in at Berjaya Times Square Hotel to take a short rest and freshen up. We were meeting Carol70 in the morning to take me to Central Market to collect something (for me to ask JKS to sign on it, which I’ll scan later when back home), then we went to JW Marriott to check in. Um, our hotel arrangement in KL was slightly complicated, as some of us had booked a room at Marriott to be closer to JKS. We reached Marriott at 11 am, discovered a group of eels there and realised our dear JKS was going to exit the hotel to go for his rehearsal. So we waited there, and waited, and waited …. Now, perhaps it’s part of my nature to complain, but I must really gripe about the unfairness of security staff in general, particularly in their treatment towards fans. The Marriott lobby area towards the main entrance is circular, with a big floral centrepiece in the centre, so when JKS comes out, he’ll either go towards either side of the circular pathway which leads to two glass entrances. In between the two entrances was a glass panelled wall, and there was a Western couple standing against the glass wall, waiting out of curiosity to see who the star was. As more and more fans lined the side of the circular walkway, Carol and I decided to move to the glass panelled wall in front of the Western couple (they were taller, so we didn’t obstruct their view at all). That position would give us a clear view of JKS coming down either side of the walkway. A fan diary from Lost Little Fish dated 2 June 2011 from Korea as she tagged along to the filming set of “You’re my Pet”. YMP filming photos on Sina have been forbidden by their authors to be re-posted elsewhere until the release of the movie. According to another fan, JKS was filming throughout the night of 1 June and on 2 June, he was still at the filming scene and catching up on his sleep during breaks. Heartache for this child. 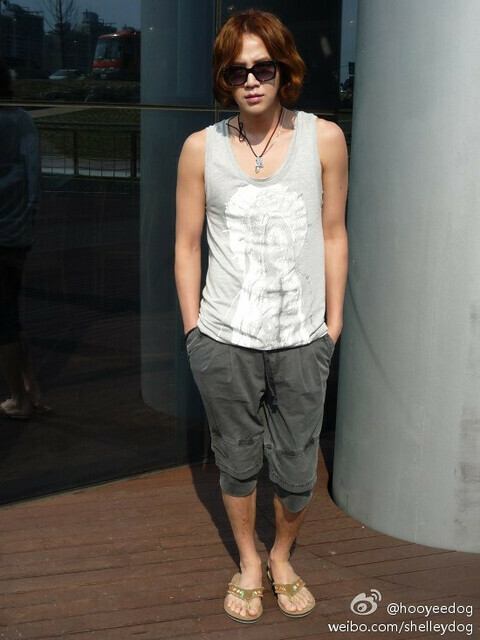 At the end of filming on 2 June, fans followed Suk to his car and a passer-by commented that the fans’ actions looked abnormal. Then this child said very loudly before he got into the car, “따라올때따라와라” ~ When you want to come/follow, please come! He’s consoling the fans and concerned that others said they were abnormal. Lastly, when he was in the car and told fans to be careful when going back home – very touching! I never thought I’d be interested in a step-by-step account of an actor’s day of filming … but I’m interested in whatever Sukkie does. Happy reading! 10.54 am: Saw Suk’s car. Continue to look for him. 10.58 am: Saw Suk’s filming crew. Two crews filming in one park. First to Veron, thanks for saying that you’re going to Bangkok, otherwise I wouldn’t have gone. Thanks for your lively company, and for sharing everything with us, and for the spa contact too. To Ferlyn, thanks for joining me on the trip (ok, I admit I was egging her on, but the more, the merrier!). I cannot remember which of us came up with the idea of staying at Four Seasons because we heard that JKS was staying there, so we booked a room there, and I had to “abandon” my original non-refundable hotel room booking at Centre Point Petchburi. Then later we heard that JKS was not staying at Four Seasons after all, because HS Media was unhappy with 411 Entertainment for posting JKS’ hotel on their website. Was disappointed, but what’s done was done. It was only on Fri 27 May afternoon that we heard news of JKS appearing for his press conference and interview at Four Seasons, but that did not necessarily mean he was staying there. Then on Sat 28 May when we returned to the hotel at 2 pm plus and saw a crowd of fans waiting at the lobby, only then were we sure that JKS was staying there. I had entertained the thought of going back to Centre Point because of the free WIFI there, and so I was packing my luggage on Saturday when Ferlyn went back down to the lobby to catch a glimpse of JKS, and she did see him come down the main central staircase to go out to the Cri Show venue. When Ferlyn returned to the room, I had changed my mind and decided to continue my stay at Four Seasons. I thought that I could wait for JKS at the lobby for him to return from his Cri Show and private party, but in the end, was too tired to do that and anyway, I’ll be seeing him again in KL. So I didn’t manage to see JKS at the hotel at all. * Note: Between these two conflicting feelings to share JKS’ wonderful LH performance with his fans and to respect JKS’ rights to his performance (I suspect I’ll get blasted by other eels for posting all the videos that I have, not many, erm, just 13? ), I have decided to post the LH videos up until Thurs 2 June night (Singapore time), then I’ll remove all except two. Although the video quality and audio is not good, you can keep them for your personal viewing if you wish to but please refrain from re-posting them elsewhere. The real star of the show is the Lounge H (LH) segment. As always, JKS is the master of the stage – he shines on stage and whipped up the atmosphere. The flashing beams of green laser, combined with the music and JKS’ energetic dance, made the fans feel so high (p.s. I take back my words, JKS can dance quite well ^^ ). JKS is simply wonderful in the Lounge H performance – no words can fully describe that feeling when he’s on stage performing LH. Somehow, I love to watch JKS swinging that big flag, maybe it’s because he looks cool and manly doing that? Just some pre-amble before going into the Cri Show… based on my limited experience so far, it is definitely not easy to be a fan. Security at Thai Cri Show was even tighter than Singapore. The lady security staff even patted my back pocket to search for cameras. I had asked Ferlyn to smuggle her slim compact camera in, so that got me worried but we managed to get through. However, in the process of trying to film, I was warned by security 3 times. All the other people were taking videos using their mobile phones, but since I had a camera, I was the only one being stopped. Usually, I wouldn’t be so thick-skinned to engage in something so blatantly illegal, but all I wanted was to take clear videos of JKS. In the end, since the use of mobile phones was permitted, I resorted to my mobile phone too. That explains why I don’t have videos of the first fan-meeting part, because I was struggling with an unfamiliar camera, various technical problems and the strict security. Not much loss there, since the fan-meeting part is quite similar to other Cri Shows. Also apologies in advance for the lack of clear pics and videos. I’ll still be posting several videos in later posts. They may not be super clear, but I think they should be enough for a general feel of the Cri Show. 27 May is a very eventful day of ups and downs, disappointment and blissful happiness. Ferlyn and I reached Siam Discovery Centre at 1 pm, and after scouting out various possible positions on level 1, 2 and 3, we decided to take up position on level 1 directly on one side of the stage, thinking that we’ll get to see JKS most clearly from there. We waited for hours there. I was having some stomach pain due to a very hurried lunch but I did not even want to move away from my precious position. Then the worst thing we dreaded happened. At 4 pm, the security came and shooed us away, explaining (I think) that fans cannot wait at that area but must wait inside the allocated barricaded area. I must admit that Security did a great job to direct traffic and maintain orderliness, but the roaming numbers of Security staff diligently doing their job meant that we lost our best viewing position. 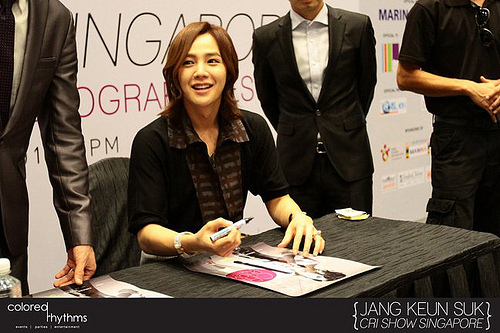 Some of you have been asking about whether JKS went clubbing after the Singapore Cri Show on 23 April. The answer is, yes, he did. I gave up on following him because of logistic problems and I was too tired. But Karen was among a group of fans who followed him that night and she related what happened. Would like to thank her for giving me consent to post it here. What happened is from her, but this is written by me with my thoughts in square brackets [ ] . Any inaccuracy in terms of details is unintentional as I was not there, but generally this was what happened. After the Singapore Cri Show, JKS went to Jumbo at Clarke Quay to have his seafood meal [must be the black pepper or chili crabs he wanted to try!]. The fans saw him when he came out once to the restroom, but other than that, he dined in his private room [my assumption]. Hi friends, I’m back rather late from the Cri Show. Being a good little eel, I didn’t bring my camera along and so there are no nice pics or close-up videos. And lucky I didn’t bring, because the security conducted such a thorough check for cameras that one would have thought they were looking for drugs or something. The reason given was that leakage of the Show’s contents would be detrimental to the rest of the Asia Tour. Erm, nevertheless I hope that there may be some illegally taken pics and videos that may surface over the next few days (haha~). Ever since I came to know Jang Keun Suk in Oct 2010, I have been looking forward to the day I meet him, and to attend his fan-meeting. On these 2 days, my wish has been fulfilled. So did I enjoy the Cri Show? Yes, I did, and the second half more than the first half. There is no doubt about JKS’ performance – I love every minute of him on stage. As he mentioned too, he caught a cold in China last week and is not in peak condition. Perhaps it is due to the fact that I had high expectations of the Cri Show, and there are times when it fell a bit short of expectations, so forgive me if I don’t sound entirely flattering. So sitting down and waiting for the event, I spent the rest of that afternoon trying to get internet access to post my airport and car chase experience, and soon it was 7 pm. There was some problems getting enough space for the group of us to dance, because everyone was pushing in to get close to the stage. We asked the public around us to give us a bit of space for that 3 mins, and most agreed generously, though I suspect some people may be unhappy with us (erm, sorry, staying up late!). Anyway, I think there is some unhappiness over some issues over space, but I shall not dwell on that here. 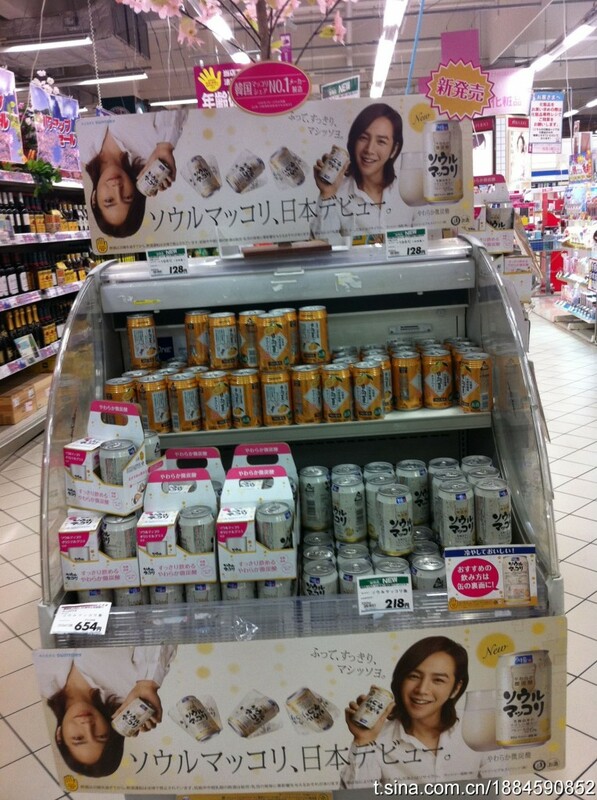 I never thought that a trip to the supermarket is worth blogging, but of course this concerns our dear Jang Keun Suk. Keun Suk is back, luckily without that explosive hair. Once out of the airport, many reporters were waiting for him. Keun Suk seems to dislike the shooting at close proximity. Feels as if he’s a bit unhappy. While Keun Suk was waiting on the sidewalk for the car, he did not forget to turn back and wave to the eels, saying “I am a tall man.” He also looked cute when he pulled a face. After I knocked off work at 5 pm, I pulled my friend out to accompany me to search for Jang Keun Suk. This friend of mine had already done some searching herself on 9 March. There wasn’t any clue, so she went round and round on a strong windy day T.T I’m so sorry … anyway, today I received some tip-off, so my friend and I went to the city centre and walking streets nearby to search for him….